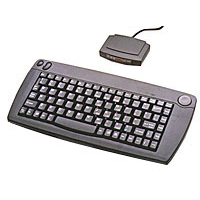 The Wireless Trackball Keyboard from SolidTek is a super-compact wireless keyboard with built-in trackball and buttons, featuring smaller than normal-sized keys. 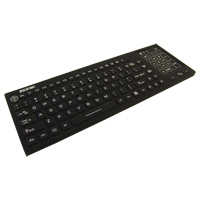 Ideal for use with portable devices, this keyboard can use alkaline batteries or rechargeable batteries and/or mini-USB cable. There is an embedded numeric keypad also. NOTE: If you are using the mini-USB cable to power the keyboard, DO NOT USE the alkaline batteries at the same time, as the keyboard will ATTEMPT TO CHARGE THE BATTERIES. Use rechargeable batteries instead, or no batteries. 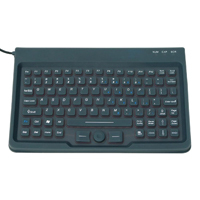 This super compact keyboard from Solidtek is designed for use in wet or dirty environments in which traditional input devices could be rendered unuseable. It is fully enclosed in silicone and meets IP68 standards. Potential applications might include manufacturing equipment data input, medical or dental environments in which equipment must be sterilized, and any location where data entry is necessary but where moisture or dirt are prevalent. 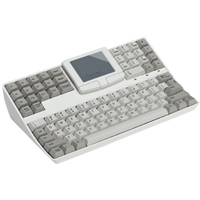 With a cursorpoint mousing device incorporated into the keyboard, and key movement that provides distinct tactile feedback, the Washable Super Compact Mini Keyboard with Cursorpoint is a complete data entry and control device in one. The narrow 9" footprint of this keyboard means that it can be used wherever space is at a premium. However, the resulting reduction in key pitch spacing (14.6 mm, or 75% of standard) could make touch typing difficult. With the possible exception of those with extremely small hands, the majority of users will find it difficult to position the fingers over adjacent keys in the usual way. Most users will find there is enough space to ensure keying accuracy if they employ a two-fingered typing style that eliminates the chance of overshooting the targeted key. 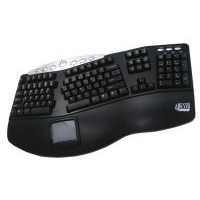 This keyboard is consequently more suitable for quick data entry than for writing. The incorporated cursorpoint mousing device is located directly below the spacebar and offers full fingertip cursor control. Large left and right click buttons flank it on both sides. Note: The entire keypad has a raised outer ridge running around it which, in some environments, could allow liquid to pool. 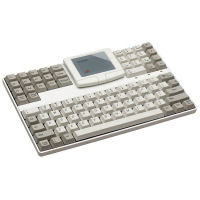 The Compact Keyboard with Trackball from Solidtek is an 89 key mini-keyboard with a small (0.8 cm diameter) built-in optical trackball and buttons. All alpha-numeric keys are standard size; the rest are smaller than normal, including the Enter, Shift, and Space keys. There is also an embedded numeric keypad (legended in blue) instead of a discrete numeric keypad. 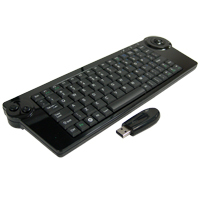 This is a wireless version of the SK595 Mini Keyboard in an infrared wireless design with the addition of a 8-way circular rocker switch (CursorPoint device) in the upper right corner for mousing. 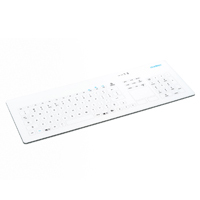 The Adesso WinTouch Pro Desktop Multimedia Touchpad Keyboard features an integrated touchpad featuring Glidepoint Technology. The touchpad provides a central pointing device option for those who find the reach for the mouse difficult. 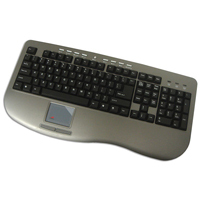 The keyboard features quiet high-resistance tactile keys and a molded palm rest. This keyboard also features 9 hotkeys that launch your important applications and control your multimedia experience. Note: There is no warranty or 30 day CSG on this item. 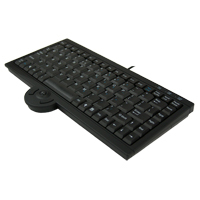 The Flat Tray Datalux SpaceSaver with embedded Cirque Easy Cat Touchpad provides a compact keyboard and mousing input solution. The entire keyboard has a low profile, making it ideal for storage in tight spaces, such as a server rack and reducing dorsiflexion. The keys are half the normal depth (i.e. same width (side to side) but shorter depth (top to bottom) - making it easier to reach upper rows for individuals with limited range of movement. In addition, the keys are negatively inclined in the keyboard, to prevent wrist extension. Available in White (Beige) or Charcoal. As well a model with a lip for ease of tray mounting is available for special order.